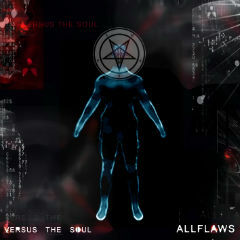 Bristol dark experimentalists Allflaws have announced that Versus The Soul, their much anticipated 3rd album, will be released on June the 18th, 2013. The album is set to be released on UK label Derelict State Records and is a timely and befitting follow up to their highly regarded 2012 EP release R Complex. Allflaws are the unique brainchild of vocalist and producer Gabriel Curran and have emerged from the underbelly of the notorious Bristol music scene with their very own deep, distinctive and progressive sound; intelligently merging strands of industrial, breakbeat, hip hop, trip hop, punk and electronica. As a vocalist, Curran’s style can be characterized by his dark, poetic and evocative lyrics, which include notable themes of science fiction, mental illness, fantasy and politics. You can check out the latest Allflaws releases and videos at their website: http://www.allflaws.com/.